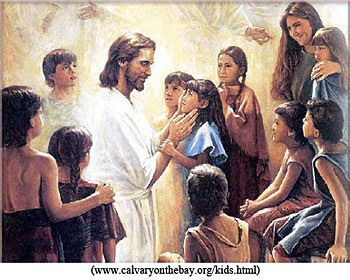 Then some children were brought to Him so that He might lay His hands on them and pray; and the disciples rebuked them. But Jesus said, 'Let the children alone, and do not hinder them from coming to Me; for the kingdom of heaven belongs to such as these.'" The Lord proclaimed that only two people of the current generation would be allowed to enter the land — namely, Caleb and Joshua, the two spies out of twelve who brought back a positive report stating they believed the Lord would defeat their enemies (Deuteronomy 1:34-38). But then, another exception was made: "Moreover, your little ones...who this day have no knowledge of good or evil, shall enter there [the Promised Land], and I will give it to them, and they shall possess it" (Deuteronomy 1:39). Another argument in behalf of the salvation of children who die before the age of accountability is the justice of God. The Bible asserts over and over that our Creator is a God of justice (Zephaniah 3:5). He has an overwhelming passion for justice (Micah 6:8). And He promises repeatedly that justice will be one of the characteristics of His Son's millennial reign (Isaiah 42:1-4). How could a God of perfect justice condemn to Hell children who never knew the difference in right and wrong? The third group that has been saved apart from faith in Jesus are those people who lived and died before the birth and revelation of Jesus as God's Son, but who placed their faith in their Creator. Hebrews 11 tells us that people like Abel, Enoch, Noah, and Abraham were justified by their faith in God. They had no Scriptures nor any knowledge of Jesus, yet because they related to their Creator in faith, they were saved. Specifically, Genesis 15:6 says that because Abraham believed the Lord, "it was reckoned to him as righteousness." That's why Old Testament saints did not go directly to Heaven when they died. They went, instead, to a place called Sheol (Hades in the New Testament), and their souls resided in a compartment called "Abraham's bosom" or "Paradise." They could not be ushered into the presence of a Holy God until their sins were forgiven. After Jesus' death on the Cross, He descended into Hades and made a proclamation (1 Peter 3:19). We are not told specifically what He said, but most likely it was, "The blood has been shed!" I'm sure those words must have produced a chorus of "Hallelujahs!" We are also told that when Jesus ascended into Heaven, He took a "host of captives" with Him (Ephesians 4:8). In other words, He emptied Hades of those who were saved. Paradise was moved from Hades to Heaven, a reality that Paul later affirmed when he said that he was taken up to "the third heaven," which he identified as Paradise (2 Corinthians 12:1-4). In Part 5 of this series answering the question, "Are there many roads to God? ", we'll tackle the difficult predicament of those who live and die without ever having heard the Gospel.